Be sure to check out my ECA Triple Clicks Store! If this is your first time on this page and you are in my SFI Down line. Lock in my SFI Training Package. I pool our funds and advertise in bulk at all the down line builder programs I will introduce you to. SHARING all NEW PSA signups with our SFI Team Leaders. REMEMBER these are brand new signups. All we can do is show them the track to go down. It is then up to each individual to put the SFI training they will receive via emails into play. If not in my SFI Team! Lock in this package at my ECA Store to learn all their is to know on how to generate a client base with repeat sales. Click the SFI Tool Box to view what you receive with setting this up as an Auto Renewal. Register to receive my SFI Boot Camp Training. Introducing A Complete A-Z online SFI business setup in a Box. Is to supply a great Network, showing my down line teams from the numerous different online opportunities I belong with, how to avoid all the scams and false hype on line. Generating a real income working online. I have invested thousands of dollars and hours over the years designing my SFI Training Blue Print..
Take you time studying this page. As with any new business it takes time to learn all there is to know on how to operate a successful working online program. The more you study and follow the plan I will introduce you to. The quicker you will start to see results. All I can do is show you what I have been doing day in day out since 2013. This is why I am the success I am today. YOU will be the master of your own destiny. Daily start with logging into SFI. Always log into SFI from this link. NEVER via emails. Start with clicking all Red Tabs Green. With EZ and The Auction Tab to turn Green you will need to spend 1 T Credit Daily. With doing these daily actions you will receive rewardicals which you can then redeem into T Credits. Once all tabs are green spend some time clicking and reviewing the Black Training Tabs. Review the Stream Posts and members contributions at the Forum. Start building your knowledge base, within six months you should be quite the expert in all their is to know about SFI Team Building and Earning. I do not promise 6 paid signup OR $88.000 overnight. This sort of promoting is pie in the sky fairy tales. BUT I do Promise! A Proven and Paying Working from home on line business. With Different Streams of income as your promote SFI at our Down line builder Program listed at ABC4Income. The key! I do not stray I have been following the same plan day in day out for years. Start building your Online Business One Step At A Time. By learning to create your own lead system! You can then co-op that system with those you refer into SFI incorporating our Dollar Wise Network Blue Print for maximum leverage. Yes, support is critical, but lead generation is the life of your business. � DOWN LINE BUILDER: Multiple Income Streams while SFI Advertising. BE sure to log into each site and enter your ID's in the down line builder programs. YOUR SFI team will duplicate the same system when they join these sites via your sponsor links. Kiwi Bonus! Show my clothing range to all your family and friends earning commissions from all sales. Start receiving Mystery Parcels in the post. Send me your SFI Id number to register for our SFI Kiwi Club. No Business No Problem. Earn from all YOUR ECA Store Sales. How to generate income with promoting this ECA Package Above..
Find the information on how much you earn. Find the promotional links to blast with other Triple Click Products. All my ECA packages include access to videos and E books I have designed. Daily to Do At SFI. I spend around two hours, following this daily plan. I start daily logging into SFI clicking the Auction Tab. Checking any launches I have not activated. This way I have any moves won ready to use to play the games. I bid in one Auction, this will then turn the red tab green. I click the dashboard Tab to see how many auctions I have to bid with to remain VIP. The TC tab I add my News for my ECA Store. Reading other ECA store updates. I redeem my rewardicals into VP or T Credits each day. I invest one T Credit Daily with the Gold Streak to activate the red tab to turn green. I spend one T Credit daily activating the side kick with the Card King. I click all red tabs reading as I go turning each individual tab Green. I click and enter the SFI Biz Quiz Answer. I make sure all tabs show green then I return and redeem 2 extra entries into the Daily Grand. I make sure to read all Gery's updates on the Stream Post and Forum News. I check all emails and send welcome E Cards to all new PSA and Top Movers. At the beginning of each week I activate the Poker and Zack Jack Games. I add a weekly post to my league page. Any Questions click top right the eye glass. Enter your question to be given all the answers. Daily Earn Rewardicals for all new store owners you introduce. Change my SFI Id to yours and blast at all the down line builder programs. If you have a physical store ADD your products to our shopping page..
Our entire community support our members. One Stop Shopping and Selling Zone Check in often. Sick of all the scams and false hype online. 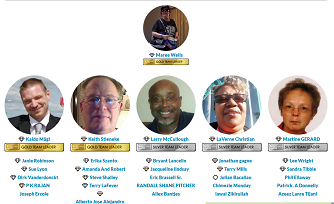 Click names to view how members are building their SFI Businesses. There is always someone available for support. Click Above Accounts then profile page to generate and find your link. When you next log into DWSEarner click above Affiliates then click Down line builder. Access the sites I use daily for SFI team Building. Unlike the emails you will start to receive, where SFI members try to lure you away to other programs. My emails introduce you to my Dollar Wise Blue Print. Where I have invested over $5000 setting up my Network family of sites to support all my team with SFI Promoting. Find all the SFI Video Training in the back office at ABC4Income. After Finishing at SFI. I log into each site. I do a little surfing at the down line builder sites you see listed at DWSEarner, I allocate credits to my SFI Promotions. Maree Designs Find in the back office all the training related to affiliate marketing on line. ABC4Income Find in the back office all the training related to SFI and Down line building. Traffic Marketer Pro Find in the back office all the training related to bitcoin generating. DWSEarner One Stop Work Station Communicating with all my team and friends at the One Location. I communicate via the surf chat bar telling everyone where I am advertising SFI. While Offering Fab Prize Giveaways for Participation. Successful paid advertising campaigns can be increased "quickly" and with reliable results. Start where you're at and reinvest half your profits each month for the first six months. This concept is exactly what I did early in my career to build up to a full-time income. Daily I log into ApSense, Ibo and LinkedIn sending away posts and accepting connection requests. I have a following of over 9500 members at LinkedIn that view my training articles and updated posts. No need to pay to get to the top of the google search. Google search me Maree Wells New Zealand. My daily participation achieves my listings. Social Media is a great way to build your Business down line FREE. Connecting with members introducing them to your Dollar wise Network. Refer 5 new members from your SFI team to ApSense Monthly and receive a Free Monthly Upgrade. When I launched DWSEarner in 2015 I was a Platinum SFI Team Leader. Every Saturday I check my Power Tool Hit Tracking for SFI. Before it resets on Sunday. See how I have added a code. Every site I list my advertising at. I add an individual code to track. I write a list on my computer to refer back to. This is how I sort out the time waster sites and decide where to invest with advertising. NEVER invest heavy with any new site. Test the waters first. I organize and run a monthly market at our local RSA Club. Every second Saturday I go and visit My Local Market. Inviting Stall holders to my Coffee Mornings I hold every Second Sunday. Every second Sunday I hold a Coffee Morning. Introducing new family and friends to SFI. Remember the days when we all hosted Avon Or Tupperware Parties. Paying a fortune for the kits. SFI is brilliant as there is no set up cost. I show them what I have purchased Via other ECA stores that supply postage to New Zealand FREE. Start Building up your Triple Click Sample kit monthly. Purchasing samples to show to family and friends. Did you know, our store is your personal store? As an SFI affiliate, you are more than a customer! You are our partner. I explain to them that some items all I have to pay for is the postage because I use my commissions for the purchases. I am buying everyday household items that are already added to my household budget. So no out of pocket expenses. I also offer incentives of free presents for bringing a few friends with them. Remember to have some goodies to reward people for their shopping. Also think of some games to entertain your friends. I often purchase when I see great items on sale at ECA stores as my giveaways at these home viewing sessions. Communicating is the life line of your SFI business. Get into the habit of using your genealogy Tab Daily. To go to your Genealogy Report. Click the link. Use the filter to send emails to individual groups. Send messages weekly. Click where you see at the left the blue envelop to open the messenger. Most IMPORTANT. Activate the ice breaker. With clicking each hand shake you see. Check your home page for when members reply they are ready to communicate. Click the reassignment tab you see in the grey box. To support your team reassigning new members. Finish each day with advertising SFI. Make sure your activate the incentive rewards for these new members when they sign up. SFI introduces in March! 8 New Incentives to activate daily. 1.. Click the Auction tab daily turning it green. View the new Auction Badge Tab. 2.. Number of free entries with Daily Crown increased. 4.. New email verification Starter Incentive now available! This is huge I have replies straight away. Check the Chat Yellow Blurb on your home page for members ready to chat. This is the reply I send to them. Hi and welcome. It may all seem overwhelming when you first begin. Check all emails for SFI support and training. Need help just ask. New incentives which will excite your new PSA and Help you expand your network. Click the link within the newsletter to take you to the set up page. Activate your incentives. Live Chat Incentive. Email Intro Incentive. Verify Email Incentive. Purchase Incentive. Astro Auctions Incentive. TIP: A 100% CV Direct Commission can be yours with a qualifying order, so be sure to factor that in when you set your rewards amount. That is, you may want to be "extra-generous," since the order is going to mean a nice commission for you! View where signups came from on March the 16th 2019. GDI. 7 Day Free Trial. This was my very first affiliate program I joined in 2009. Apply to have your commissions paid via A Bank Wire at GDI. Shares Referrals and Fab Prize Give Away Prizes. Sale leads System for achieving SFI Team Leader Monthly. Your One Stop Training Zone Supplied at ABC4Income. Simple to follow Videos and Article in the back office. Easy Down line builder to Explode your SFI business. Make This The Year To Set Up Your SFI On Line Business Opportunity. 6.. 100% CV Direct Commissions now even juicer! 7.. Opti-Build" is great to activate if you wish all your team building to be done on auto pilot. Allowing you to concentrate on your advertising. I share new sign ups with active members that communicate with me. Teaching them how to duplicate with their five, then these five teach their five, so on and so on. 8.. Introducing...the Zing Network Ad platform! SFI believe it's time they allow our seller partners (especially ECAs at TripleClicks and Rewardical, and Localvantia merchants) to use the network to promote their brands and products to our members. We kick things off for ZNA with the opportunity to sponsor the daily tabs at the SFI Affiliate Center. Click where you see all the writing is in blue. Study and Learn. To turn tabs Green scroll to the bottom of each page and click the blue tab confirming you have viewed the information above. YOU need to read to succeed. YOUR participation will determine your results. Proof the system works. View My Genealogy Report in 2017..